By Laura - Argentina - 08 Oct/02 - Viewed 1660 times. 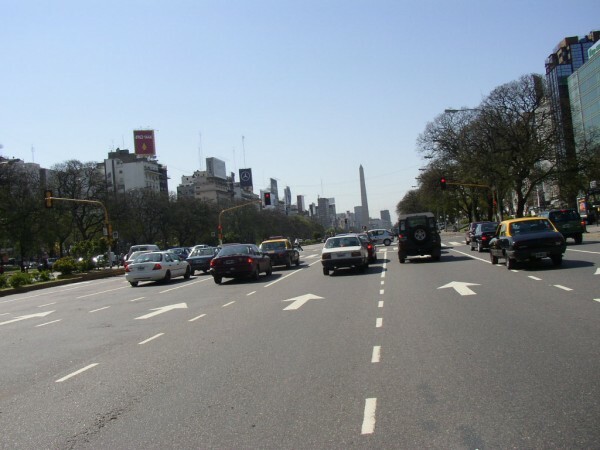 We�ve finally arrived at our hotel in Buenos Aires. We spent the week before we left packing up our house, which we should have left a month to do. It meant that it was a very stressful last week and we were doing stuff right up to the moment we left for the airport. Both of our parents came to the airport to see us off. Unfortunately, the initial part of the journey from Ferndown to Southampton, which should take about half an hour, took over an hour and a half. It was a bit of a panic but we managed to arrive on time. After a last veggie burger at the airport (don�t know when I�ll get one of those again) we got on the plane. We managed to sleep for most of the flight so hopefully the jetlag won�t be too bad. After arriving at Ezeiza airport in Buenos Aires we went and sorted out some Aerolineas Argentina flights that I had reserved and then we got the Manuel Tienda Leon coach into the centre of town. This cost A$12.80 each and dropped us off at Avenida Santa Fe. We thought that this was a long way from our hotel and walked for at least a mile to where we thought our hotel was. After searching around for a while it eventually became apparent that the map we were looking at should be the other way up. They don�t have all their maps with north upwards here. In fact the hotel was not too far from where we were dropped off initially. We stopped off at a cafe for a rest before heading to the hotel. Everyone in the cafe seemed to be drinking shots of orange juice. I guess we�ll find out why later on. We are struggling with our Spanish here and need to have some lessons as soon as possible. You cannot really get by in English here. We are staying at the Fiamingo Apart Hotel on Avenida Talcahuano. It is pretty good and costs A$70.00 per night for a double. We will have to start staying at cheaper places soon though.